Australia will need to adjust to new business and social norms as Asia becomes an increasingly important global player, the Secretary of Victoria’s Department of Premier and Cabinet, Mr Chris Eccles, told the launch of the 2016 Asialink Leaders Program in Melbourne. Mr Eccles said Asia’s projected growth had enormous implications. Urbanisation and demographic changes were creating demand for goods and services that “will alter our business patterns”. “As Asia becomes an increasingly important global player, Asian systems and norms will have a stronger influence over how the world operates,” Mr Eccles said. 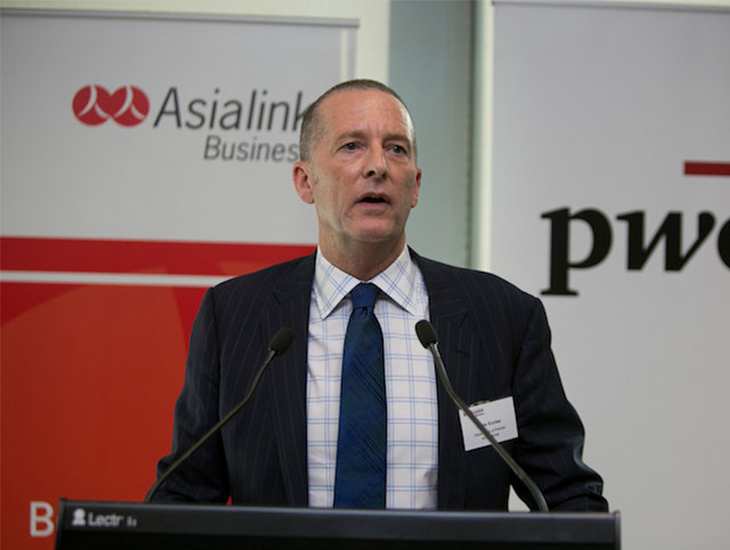 Mr Eccles gave the keynote speech at the launch of this year’s prestigious Asialink Leaders Program in the Southbank offices of PwC, which hosts the program in Melbourne and Sydney. Thirty-four senior professionals embarking on the 2016 Leaders Program were joined by their employer representatives, alumni of the program, and distinguished guests. In total this year around 70 senior professionals from business, government, the arts, media and the non-profit sector are joining the nine-month Program in Melbourne, Sydney and Brisbane, where it is hosted by Herbert Smith Freehills. Mr Eccles congratulated this year’s participants for being selected to join what he said was “Australia’s leading professional development program for building Asia capabilities”. He said engaging with Asia was “a big part of the Victorian Government’s strategy to grow jobs as we shift our focus from industries in decline, to areas with huge potential for growth”. Victoria was already strongly interconnected with Asia, but significant opportunities included in food and beverage, tourism and education. There were also opportunities for Victoria to partner with Asia in health, infrastructure and sustainability, as well as in clean energy. “Institutions like Asialink and programs such as this provide us with the capacity and insight to engage with Asia on many fronts, not just economically,” Mr Eccles said. “Asialink plays a critical role in helping Victorians develop the knowledge and skills needed to adapt to Asian cultural contexts and building productive, long-term networks. PwC Partner Mike Sum, who hosted the launch, provided his personal perspective as the son of Chinese parents who came to Australia 65 years ago and worked hard for a new life. Mr Sum, a mergers and acquisitions specialist who has worked extensively in Asia, encouraged Leaders Program participants to make the most of their opportunity in 2016 and help to drive change for Australia’s future. “If not you, then who?” he asked. 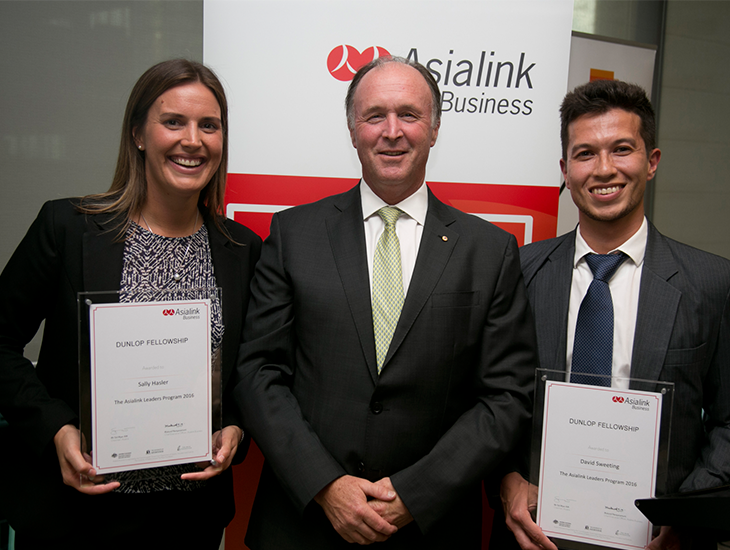 The Chairman of Asialink and Asialink Business, Mr Sid Myer AM, presented two full-fee Dunlop Fellowship awards, named in honour of Sir Edward “Weary” Dunlop. This year’s awards were to Sally Hasler from the Fred Hollows Foundation and David Sweeting from Save the Children Australia. 2015 Leaders alumnus Tamara Kearsley, who works at Austrade as International Education Manager, welcomed this year’s participants and urged them to maximise the opportunity to build relationships across sectors and “think big” on their Asia-focused workplace project. For more information visit Asialink Business.